Diesel Services of America provides you with the expertise of our factory trained technicians for all your marine diesel service inquiry, maintenance, and service needs. We are marine diesel specialists that have been in service since 1956 and in this time have built a name synonymous with integrity, dependability, and trustworthiness. Our company is based in Fort Lauderdale but has grown to serve the greater South FL area as well as the entire Caribbean. 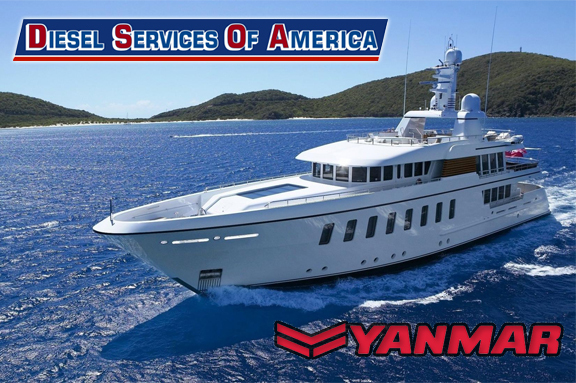 We can provide service, maintenance, and replacements for all genuine Yanmar Marine parts. Yanmar Marine International is one of the most respected and dependable diesel engine providers in the market. Yanmar has been shaping the industry for over a hundred years creating, envisioning, and reinvesting some of the world’s greatest diesel engines. Yanmar has because of this had ample time to evolve into the grand company it has become. Yanmar Marine International has been described by their current president, Shiori Nagata, as “leveraging the latest technologies” and “more than a forward-looking engine company.” These assertions are backed by the company standards that Yanmar has been upholding for over a century. Yanmar Marine International brings consumers sustainable solutions for high-performance diesel engines. Our team at Diesel Services of America esteem and appreciate our clients tremendously. For this reason, we strive to provide the high-grade products you deserve. Products that will never endure the test of time as well as the conditions you push them through. Our high-grade products paired with our passion for expert maintenance provision will ensure that your marine diesel engine and generator will be working when you need it or want it most. We take pride in knowing our customers will carry only the highest quality marine diesel parts to keep your engine powerful and healthy. Yanmar Marine parts are among the finest in the industry. They will help maintain your engine running optimally and sustainably. Contact us today to schedule a service appointment or to speak to a diesel engine professional for a consultation.